Air conditioning and heating systems are complex, which is why you cannot trust just anyone to provide service when something goes wrong. Instead, you should call highly trained, experienced, and dedicated residential or commercial HVAC specialists. And that’s what you find at Comfort Incorporated. We provide commercial heating and cooling services and HVAC (heating, ventilation, and air conditioning) service for homes throughout Moore, OK. We offer excellent maintenance plans, have the latest diagnostic equipment, and treat all of our customers with the respect they deserve. Call our team today for excellent service every time for your next heating, air conditioning, or indoor air quality service or installation. Contact us to request an estimate on heating and air conditioning services in Moore, OK. Your air conditioning system has just broken down, and you need service fast. Should you call a nearby handyman, or should you trust a local air conditioning specialist that has been trusted in the area since 1953? The answer is clear. Quality air conditioning service and installation is available from highly-trained technicians at Comfort Incorporated. We offer heat pump, ductless system, geothermal cooling, and conventional central air conditioning service. This includes AC installation, repair, and routine maintenance. You can count on our technicians to not only know what they are doing, but to treat you and your home with respect as well. When you need AC repairs, we make sure to show up on time and bring all of the tools we may need. We offer a 100% customer satisfaction guarantee! Our maintenance members get 15% discounts on our AC repairs as well. Whether you need heating repair or would like to install a new heater in your Moore home, make sure to work with the professionals at Comfort Incorporated. Our heating technicians are NATE-certified to ensure top level service. Simply give us a call to learn more about our Moore, OK heating services. In the middle of winter, a broken heating system is an emergency. You cannot expect to get through the night in comfort without it, and it could put your pipes, your home, and your health or the health of family members at risk. At Comfort Incorporated, our motto says it all: "We keep your family safe, healthy, and comfortable." That’s why we offer 24-hour emergency heating services for maintenance plan members. We also provide expert heating installation, scheduled repairs, and routine maintenance services. Call our team to learn more about our heating services or to schedule repair for your heat pump, furnace, or dual-fuel system. Get your heating system repairs completed quickly when you call our experts. Waiting too long to schedule heating service can result in a broken-down system, so call us if you hear odd noises from the heater, notice it shutting off frequently, or become concerned by lower-than-usual temperatures. If you need heating replacement, we will put your mind at ease with a quality, high-efficiency system. Are You Looking for Expert Commercial HVAC Services? When you need commercial heating and cooling services, trust the experts at Comfort Incorporated. We have been in the area for 64+ years. And in that time, we have built a reputation in the community, providing the HVAC installations for department stores, schools, and other businesses that trust us as their main commercial HVAC contractors. Let us make you a customer for life. Call us for commercial HVAC replacement, repair, or new installation, and ask about our commercial HVAC maintenance services. Moore, OK homes can suffer in efficiency when air leaks out of the ducts rather than moving straight to the rooms of a home. Air duct sealing can help to keep your home more comfortable and reduce your bills. When you seal up the ducts, air has a straight path from the air handler to your home, which means no hot or cold spots around the home. We can also provide other efficiency solutions, such as air sealing, insulation, and home energy audits to diagnose the problem in the first place. They was here early. Got right on the job and worked hard throughout the day. replaced an old a/c unit with a new one.we have used them in the past with great results.Travis did an exceptional job and fixed 2 other little problems we were experiencing related to this unit's replacement.Would highly recommend this company! 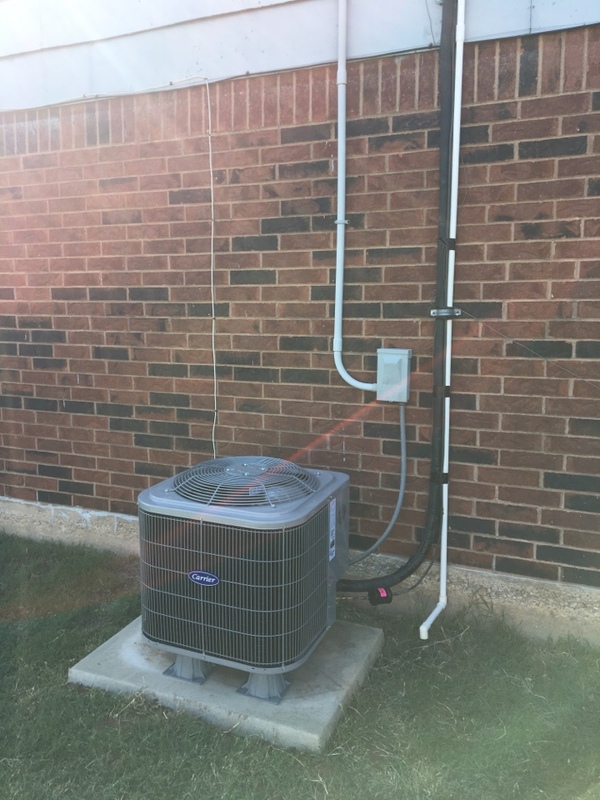 Installation of Carrier complete system in Moore. Installed 2 ton Carrier A/c.